Madison Heights, Mich. – DME Company, a leading manufacturer of mold technologies, will be presenting a wide range of its hot runner products at NPE 2012, booth #2803. For over 30 years, DME has offered a full spectrum engineered solutions essential for hot runner applications – everything from unitized valve gates to hot sprue bushings to complete turnkey hot halves ready to bolt on and operate. The company will be demonstrating many of its existing and new technologies at NPE in Orlando, Fla., from April 1-5, 2012. Through its parent company, Milacron LLC, DME is linked into a vast network of resources and institutional knowledge that enable its engineers to better understand how its product fit into an overall production scheme for its customers. DME provides rugged, energy-efficient systems, and backs them with service and support that customers have grown to rely on. Today, the company continues to develop a new generation of hot runner systems that give customers marketplace competitive edge. In fact, the company is now able to provide a number of “off-the-shelf” hot runner solutions, including components with same-day shipping, manifolds & components in 3-4 weeks, unitized systems in 4-5 weeks and full hot half systems in 5-6 weeks. • Manifold & Components DME delivers custom manifold and all critical components – including nozzles, heaters, support pads, dowels, terminal boxes and a design guide for layout of pocket machining. The manifold arrives completely machined to customer specifications with flow channels, both horizontal and vertical, and end plugs. Fast delivery is available on any of DME’s open gate hot runner nozzles, including leading lines such as Stellar, Galaxy, Hot One, Gate-Mate and Cool One. • Unitized Systems DME also offers Unitized Hot One, Galaxy and Stellar Systems. If customers lack the time or resources to assemble the manifold and components, these open gate or valve gate systems arrive plumbed, assembled, pre-heated, tested and ready to go. 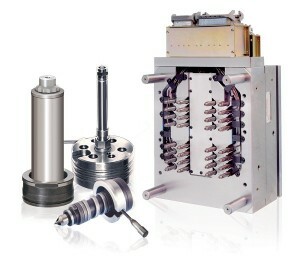 DME will also be introducing its new Unitized Valve Gate Hot Runner Systems at NPE. DME’s valve gate hot runner systems offer superior cosmetics coupled with a simple setup. Just drop in the fully unitized valve gate system because everything is plumbed, assembled, pre-heated and tested before shipping. Choose from a comprehensive selection of high-quality components and systems for nearly any type of material. • Full Hot Half Systems DME is also able to deliver a complete package system – matching unique gate locations, materials and other parameters. The systems are delivered fully wired with prepped water cooled plates and with riser pads and other components already fitted – eliminating the hassle of leaks or other headaches. With simple machining of the clearance bores, customers are ready to bolt on the A plate and start molding right away.